You guys. It's finally happening. We're finally starting to hear from women directors speaking publicly about being discriminated against. Finally. When it comes to gender inequality, it would be hard to come up with an arena where we see it on a larger scale than in the scarcity of female directors. It's been such an ongoing, pervasive issue that I had almost given up hope it would ever be addressed, let alone actually changed, but the recent announcement that the Equal Employment Opportunity Commission (EEOC) will be investigating the industry's "systemic failure to hire women directors at all levels of the film and television industry," as the American Civil Liberties Union (ACLU) phrased it in the grievance they filed with the EEOC, has me feeling the first subtle tinglings of optimism. And, before you call me out on those feelings being premature, bear in mind that this even being a topic for conversation is a new and very exciting thing. For the first time in my lifetime, this conversation is going past the moment when you ask someone to name three female directors, and they start sputtering after only two — typically Kathryn Bigelow and Sofia Coppola. There are already so many impossible obstacles standing between female directors and Hollywood jobs that there's very little incentive for any of them to speak up; why would you want risk the few opportunities that you may have been able to glean by being labeled "difficult?" As much as I've wanted to hear women speaking up about their blatant discrimination, when a single comment can sideline their careers for years if not forever, I can hardly blame those who have stayed silent. But there are some brave few who have spoken out about the shoddy treatment of women in the field, and more and more women have been adding their voices to the movement. And, if we're really serious about making changes in this industry, we need to listen to what they have to say. Surprising that more women aren’t hired? That only 6 percent of films are directed by women? It’s appalling. Then when you hear that people who are buying TV shows sort of feel there’s some kind of quota, like a “We already hired a woman this year” kind of thing, and then when you hear those kinds of things, it’s shocking. I thought after Twilight my life was going to be easy. I was the first woman to do that. But no, it hasn’t been easy. I ended up taking a pay cut [on my next film]. I guess I thought after the success of Twilight, I might have had a bigger opportunity instead of a smaller one. [...] [But] I’m a five-four female from Texas with no family ties to this business. Of course there are double standards. No one can say it’s a level playing field. Hardwicke said that was the first time she thought there was gender discrimination, because she'd raked in money for the studio, but still faced almost a complete lack of offers. Kimberly Peirce directed Boys Don't Cry, the film that won Hillary Swank her Oscar in 1999 (but noticeably did not receive nominations for Best Picture or Best Director), but didn't get another opportunity to direct until Stop-Loss in 2008. Seems like a pretty obvious missed opportunity in the male-dominated industry. I go to Sundance. I see the number of women who get that far with their movies, who have the talent, the determination, and the commitment. But then that’s not reflected in the percentage of movies coming out in theaters. That tells you there’s a systemic problem. Couldn't put it any better than "systemic problem." Lexi Alexander has directed action movies like Green Street Hooligans and Punisher: War Zone, making her an obvious choice for these big-money superhero movies that studios can't stop churning out. However, she seems to have come up against the glass ceiling, as her career has never taken that next step. The studios are big companies; they have shareholders. They’re actually not allowed to be that discriminating. It’s weird though, because there’s so many levels, the level where the discrimination happens is not often associated with the shareholder corporation level. I’ll hear of these stories where a network will push a certain show to hire more women, but the show-runner refuses because he just doesn’t like women. Insane that we live in a world where sexist blanket statements like "I don't like women" are not only acceptable, but considered good enough reasons for men not to hire with them. 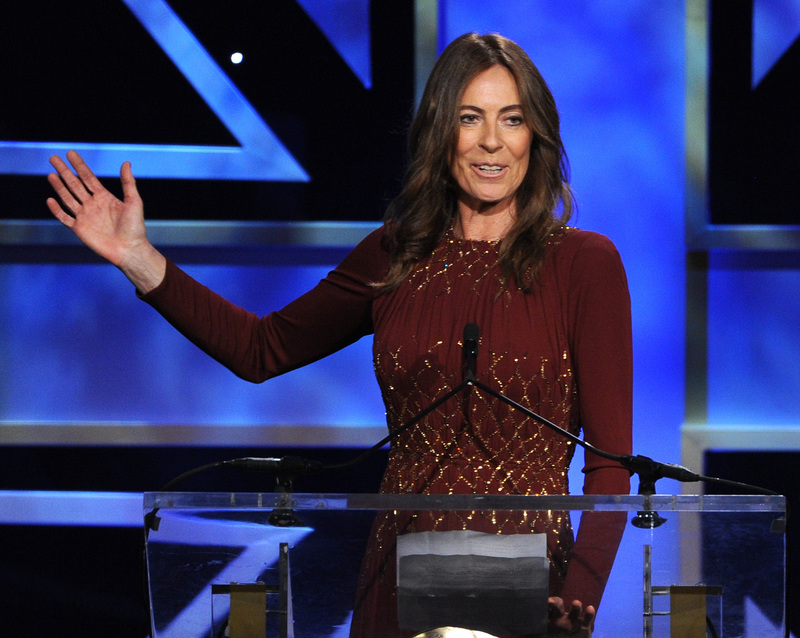 Known for the honor of being the only woman ever to win the Academy Award for Best Director (for The Hurt Locker, in 2008), Kathryn Bigelow was also the directing force behind Zero Dark Thirty and Point Break, and is at the ideal vantage point to take note of Hollywood's pervasive gender bias. I have always firmly believed that every director should be judged solely by their work, and not by their work based on their gender. Hollywood is supposedly a community of forward thinking and progressive people yet this horrific situation for women directors persists. Gender discrimination stigmatizes our entire industry. Change is essential. Gender neutral hiring is essential. Cox directed episodes of television shows like M*A*S*H* and L.A. Law, making her simultaneously a pioneer in the field of women directors and very very lonely. This was a community of a hundred guys who had never had a woman leading them, and who didn't want to have a woman leading them. I went to the trailer where the hair and wardrobe departments were because it was the only other place on the set where there were some women. ... I needed to escape the harshness. And this was back in the 1980s, so it's pretty insane how little progress has been made since then. Here we are, inside our own privileged bubble, award-winning members of this community, victims of a very different sort of brutality. We women have literally been disappeared from the profession because of our gender. Wow. The phrase "disappeared from the profession" legitimately gave me goosebumps. Mimi Leder directed the enormously successful Deep Impact in 1998, then stumbled slightly with the less-than-well-received Pay It Forward in 2000, which took an eight-year bite out of her film-directing career. It's a punishment she doesn't believe she would have received if she'd been a man, saying, "If you’re a woman and your movie flops, you go to ‘jail.'" In fact, she never really made a full return to movies, instead being relegated to TV series like The Leftovers and Shameless which, while great, still aren't movies. Betty Thomas, who has directed films like Private Parts, Dr. Doolittle, and 28 Days, along with many others, says she hasn't personally experienced sexism in Hollywood, but she's certainly witnessed it. Of course, [directors] have to be OK-ed by the network, so the network always says, 'Ohhh, it's the showrunners, they won't let us hire more women.' And then the showrunners meet with us, and they go, 'Oh, we've never seen numbers like this!' That's an actual quote. 'Oh, and I can't believe we've never had a minority person or a woman in 13 years!' That's an actual quote from a meeting that I had. As discouraging and overwhelming as all of this is to read, I'm thrilled that we're finally hearing from these women who have been repeatedly hamstrung in their own careers. I can only hope that more voices will join them from other marginalized female directors like Ava DuVernay, who, as a female director of color, has it even harder, getting snubbed across the board for her direction of Selma , and many more ballsy female directors who undoubtedly have stories to tell. Let's make this into an avalanche that demands change permanently, and for the better.